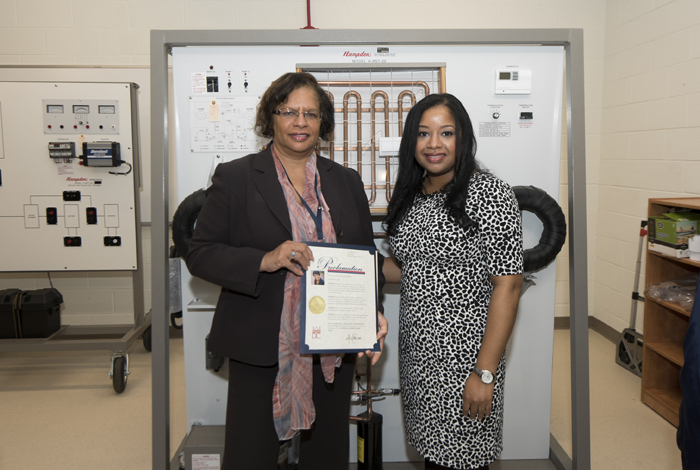 TO LEARN & EARN IDEA Principal Lanette Bacchus (right) with DOES Director Deborah A. Carroll, recognizing D.C.’s National Apprenticeship Week with a mayoral proclamation. The scenario plays out something like this: A young teen in high school hears there’s a chance to make good money by going the untraditional route. The student is encouraged to pick up some classes to gain exposure to electrical or carpentry work. That way, she and other students can learn math and technical skills that one day could lead to a well-paying job. Sounds interesting. So, she shares the news with her parents. The suggestion makes them frown, and they question her interest, and also the school’s encouragement for their daughter to consider skilled trades as a future career option. This is just one of the challenges the school administration faced when the Academy of Construction and Design joined IDEA Public Charter School and brought skilled trades to career and technical education (CTE). But it’s an obstacle administrators have overcome. 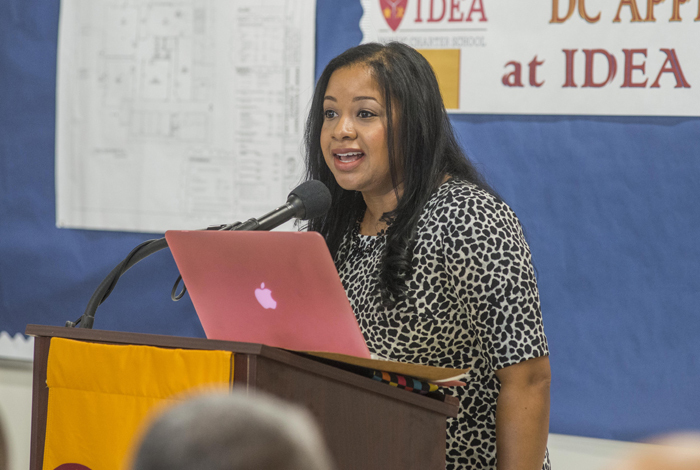 JOBS Coalition Pathways talked one-on-one with IDEA Principal Lanette Bacchus about overcoming stereotypes surrounding career and technical education and the benefit of bringing the Academy to the public charter school in Ward 7. Bacchus: IDEA has always been focused on academics. We’ve always had an academic, college preparatory component. But a part of our mission speaks to getting students prepared academically, socially and through leadership and post-secondary skills. As a part of what already existed, our CTE program is very bare bones, and I think this [ACAD] is the missing piece to the puzzle that we need to add to ensure that our students see the vast opportunities [and realize] there are more options for them. So now it’s not just Microsoft Office, it’s not just architectural design. Now we’re looking at the foundational components ... you don’t have to guess what it’s like to do hammering inside a room; you know what those skills look like. Then outside of construction, we’re actually making a connection to our architectural design program that already existed. We learn the skills and now we use the application. From here, [students] can move into an apprenticeship and begin to think about if I don’t decide [to go] to college or if it’s not an option for me, here is another option. Or, if I do decide to go to college, I can be an architect. Bacchus: It does ... help with their mathematics and their basic skills building. As we know, students who have come in from traditional schools – we know that other schools have failed them. They come here, they are underperforming in math or underperforming in reading. A lot of the components [of ACAD] help them build foundational skills in math to help support [work] in algebra and geometry specifically, because a lot of those math skills talk about angles and what it means to have a perimeter. All of these things are now applied and [students] see the connection. There is an application component to what we learn every day. It is a new day for educating our parents on what [skilled trades] means by sending memos out, meeting with them during orientation and talking about what it means to have a career in technical education. It is not what you [know], the implied meaning of it. It means that your children can have a career. If they choose to, they can go and get technical training or they can still go to college. And on top of that, they mine new skills that they’re building along the way, helping to support what they’re already doing in their core academic programming. Our students are now going back and talking to their parents too, and saying: “This is what we’re really doing and I really love it!” When I was initially met with opposition when placing students in classes that they may not have chosen because they didn’t want to do this, they came back and said, “Don’t take me out, I love this class.” It’s a paradigm shift for our students and our parents. JOBS Coalition Pathways spoke with IDEA PCS Principal Lanette Bacchus during the ribbon cutting for the Academy of Construction and Design. This interview has been edited for content and clarity.